"Its very difficult for me to talk about [what I went through. I'm partly worried that women who are actively involved in the women's movement would fear that they could face torture in case of arrest. But my message to all Iranian women who fight for their rights is that their struggle should [continue] with courage." Local journalists and activists, including Toloui, had reportedly criticized the wave of repression that followed the unrest. 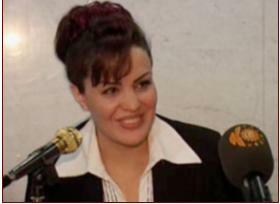 Toloui who had been summoned to court on several occasions in connection with her human-rights work, and was arrested in her home in Sanandaj on 2 August. place in prisons and detention centers. When the Iranian government refused to register the Association of Kurdish Women for the Defense of Peace and Human Rights, Dr. Roya Toloui, one of its founding members, spoke out. In what appears to be retaliation, Dr. Toloui was summoned to appear before a revolutionary court in Sanandaj on April 5, for interrogation. Dr. Toloui is a leading Kurdish women�s rights and human rights activist and a champion of the rights of Iran�s Kurdish minority and women�s rights in Iran. Dr. Toloui is an outspoken nonviolent critic of the policies of the Iranian government. The revolutionary prosecutor in Sanandaj, the capital of Iran�s Kordestan province, has claimed that her public comments jeopardize national security. She has also been criticized for being photographed not wearing a headscarf that all women in Iran are required to wear in public. Join Human Rights First in supporting Dr. Toloui�s right to freedom of expression. Urge the Iranian government to cease its harassment and intimidation of human rights advocates. Roya Toloui is a leading Iranian human rights defender who speaks out for the rights of the Kurdish minority, especially those of women. She currently resides in Sanandaj, the capital of Kordestan province in western Iran. Kurds are a minority in Iran, comprising some ten percent of the population, concentrated in the western provinces of the country. Human Rights First fears that Dr. Toloui�s summons to the Revolutionary Court could result in her being detained or subject to prosecution. Trials before revolutionary courts often take place in secret and without regard for internationally recognized fair trial standards. The harassment of women�s rights and NGO leader Dr. Roya Toloui is part of a continuing and broadening clampdown on independent activist of all backgrounds. In recent years, as other avenues for activism and free expression were closed by the authorities, large numbers of young people, including many women, became involved in officially recognized NGOs active in fields like women�s rights. Focusing on private sphere issues like child custody, inheritance, domestic violence and divorce, these activists found space in which they could organize without confronting the repressive force of the state head on. Even these avenues are now being blocked. As a Kurd seeking to form an organization that addresses Kurdish rights within Iran it is likely that she faced additional hurdles. Kurds are an economically disadvantaged ethnic minority and their distinctive language and culture has suffered in comparison to the dominant Persian culture. Moreover, most Kurds are Sunni Muslims, a religious minority in the Shi�ite Islamic Republic. Asserting Kurdish cultural rights remains controversial in Iran. A senior government official, Abdollah Ramazanzadeh, who is a Kurd and a former governor of Kordestan province, recently came under harsh criticism in the government controlled press for suggesting that Kurds should be treated as full citizens of the country, given a fair share of the national resources and be able to develop their language and culture. Critics remarked that Ramazanzadeh�s comments �endangered national security,� echoing the accusations made against Dr. Toloui. The Iranian authorities should support and protect the work of human rights defenders such as Dr. Roya Toloui instead of targeting them for interrogations and restricting their freedoms of expression and association. Please speak out today in support of the crucial work of Dr. Roya Toloui and other human rights defenders in Iran by sending a letter calling on the government to accord human rights defenders basic rights and freedoms. management has decided to sell the Charity Center. security agents to retreat for now. hospital for broken arms or noses. expenses of the regime's higher leadership. in order to calm the scandal. back from San Francisco to Tehran and executed upon hisreturn. in reality a screen company for the first entity. Iranians who stole in order to feed their hungry families. factories sold to rich affiliates of the Islamic regime. individuals with close ties to the theocratic regime.